We at Genuine Attestation Services offer the Saudi Arabia certification services for our clients. It includes certificate attestation, document attestation, commercial document attestation, embassy attestation, and educational document attestation etc from Saudi Embassy at reasonable rates. In addition, we also render HRD Attestation and MEA/Apostille service in Delhi. 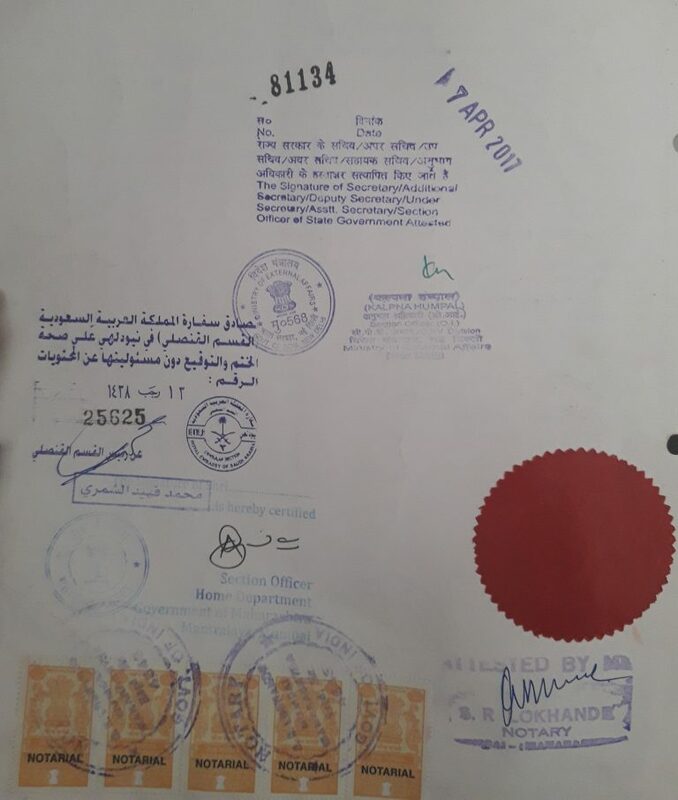 We are engaged in this profession of certificate attestation for Saudi since long and have made numerous clients satisfied by providing effective services in area of Saudi Cultural Attestation. Getting your document attested seems to be roller-coaster ride, especially if we don't possess any know-how about the procedure. If you are planning to shift in Saudi Arabia for any of the reasons, it is obligatory to get all your documents authenticated from Embassy of Saudi Arabia with consent to their legal use in that nation. For Saudi attestation of your certificates, you have to go through little lengthier process within your home country, thus you have to be patient till it get completed. There are several benefits of getting your certificate/documents attested from Saudi Embassy. The below points will help you in clearing your doubts and confusions. It is advantageous, if you are willing to pursue any higher studies in Saudi. It aids in increased chances of attaining an employment visa. It is beneficial to attain residential visa, if any of you were planning to get settled there and it also makes easier to get visa for your beloved family. It is beneficial to get admission within schools of Saudi. It is beneficial in attaining employment visa and hence increases work opportunities open up within Saudi. It will also help you out in getting all health benefits. The concerned document should be authenticated first by the Human Resource Department of the state, where the document is originated. Final attestation is done by the Saudi Embassy and Saudi Culture Attestation. Note:-Degree should be earned through Full Time / Regular Mode only. (Saudi Cultural Attaché does not attest any degree/certificate/diploma earned through online/distance/private mode). Original Offer Letter/Contract from KSA, in Arabic or English, on company letterhead, attested by Saudi CHAMBER OF COMMERCE, and Saudi FOREIGN MINISTRY, not more than six months old. Undertaking from the candidate on Rs. 10 or 20 Governmental Stamp Paper about the degree genuineness, Paste photograph in it and do notary. Iqama Color Copy For those who have already on Job in Saudi. One fresh letter in which his experience details and a valid Iqama should be mentioned with company Ref No. and date. Both letters attested by Saudi CHAMBER OF COMMERCE, and Saudi FOREIGN MINISTRY, not more than six months old. Initially, the process of attestation will be made at Home Department of the state from where document is issued. Attestation process will be followed at Ministry of External Affairs, New Delhi. Thereafter, specific commercial document will be attested at Ministry of External Affairs, New Delhi.